Just Released: The Top 1,000 Power Broker Firms in the U.S. The real estate industry’s longest running ranking of the nation’s top brokerage firms, RISMedia’s Power Broker Report, is now available featuring the Top 1,000 firms for 2017, ranked by both 2016 sales volume and transactions. RISMedia released the Top 500 firms in the April issue of Real Estate magazine. 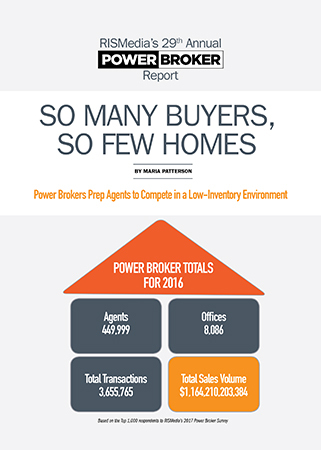 In addition to ranking real estate firms by sales volume and transactions, the Top 1,000 Power Broker Report includes important research on market trends and brokerage operations, as well as insights and commentary from brokers across the country. Used as an important reference tool, the Report also includes the Top 1,000 firms listed by state, as well as alphabetically. Brokers who make the ranking in RISMedia’s Power Broker Report will be invited to gather at RISMedia’s annual gala, The Power Broker Reception & Dinner, taking place on Friday, Nov. 3, 2017, in conjunction with the REALTORS® Conference & Expo in Chicago, Ill. Power Brokers will also receive an invitation to RISMedia’s exclusive Real Estate CEO Exchange, taking place at the Harvard Club of New York this Sept. 12-13. Seating is limited, so please contact Randi Vannucchi to reserve your spot: randiv@rismedia.com. For more information, including the agenda and speaker line-up, please visit rismedia.com/rismedia-ceo-exchange/.